About five years ago the pastor of a Messianic congregation in Tacoma, Washington, by the name of Mark Biltz, began to teach that the Second Coming of the Messiah would likely occur in the Fall of 2015. He based this prediction on the pattern of an astronomical phenomenon that he had discovered. His speculation was picked up immediately by the Bible prophecy sensationalists who specialize in playing around with such matters. The result was that Biltz's theory became an Internet sensation. The basis of his theory — and not his conclusion — has now been given legitimacy by the publication of Pastor John Hagee's book, Four Blood Moons (Worthy Publishing, 2013). But is the Mark Biltz's theory really legitimate? The first red flag of caution that must be considered is the source of the theory. Mark Biltz is not a mainstream Messianic rabbi. Instead, he is involved in what is called the Hebrew Roots Movement. This is an anti-Christian, Judaizing movement that has many of the characteristics of a cult. Its members have done everything they can to de-legitimize the teachings of the Apostle Paul. They consider him to be an anti-Semite because of his teaching that the Law of Moses was invalidated by the Cross. The second red flag is that Biltz is involved in date setting. Both Matthew 24:36 and Matthew 25:13 state that we cannot know the day or hour of the Lord's return. With regard to the parable of the wise and foolish virgins contained in Matthew 25:1-13, Biltz dismisses Jesus' warning in verse 13 that no one can know the day or hour of His return. He does this by arguing that it is directed at the foolish virgins, and not the wise ones. Yet, there is nothing in the parable to substantiate this conclusion. With regard to Jesus' similar statement in Matthew 24:36, Biltz tries to explain it away by saying it is a reference to the Feast of Trumpets because although there is a yearly date for this feast, no one knows for certain when it will actually begin because its beginning is dependent on the sighting of a new moon. Again, there is no justification in the context of this verse for such a bizarre interpretation. The Rapture of the Church must occur. The seven year period called the Tribulation must take place. The Jewish Temple must be rebuilt. The Antichrist must be revealed. A second Jewish holocaust must occur. To his credit, John Hagee does not set a date for the Lord's return in his new book, Four Blood Moons. Instead, he simply takes Biltz's discovery and argues that it is an omen of a major development that will take place — a development that will most likely have a significant impact on the Jewish people. So, what is this omen that Biltz and Hagee have in mind and which they refer to as "the four blood moons"? A "blood moon" is the name that has often been assigned to a complete lunar eclipse, which occurs when the earth comes between the sun and the moon, putting the moon into a complete shadow. Such a moon often (but not always) appears to be red in color because of the way light bends around the earth's atmosphere, scattering short wavelength light (green through violet) and leaving longer wavelength light (red, orange and yellow). It's why sunsets and sunrises generally are red. Complete or total lunar eclipses are relatively rare. During the 20th Century, there was a total of 229 lunar eclipses of all types, but only 81 of these were total eclipses (completely obscuring the moon in the earth's shadow). The rest were partial eclipses. In this century there will be 228 lunar eclipses of all types and 85 total eclipses. What is rarer is what is called a "tetrad." This is a series of four total lunar eclipses in a row over a two year period of time. Since the time of Christ there have been a total of 87 tetrads, including the last one that occurred in 2003-2004. In this century, we are scheduled to experience 8 tetrads, the most that can occur in a century's time (some centuries have had none at all). Even rarer is a phenomenon that Mark Biltz discovered. Of the 87 tetrads that have occurred since the time of Christ, only 7 have fallen on Jewish feast days. Those seven occurred in the following years: 162-163, 795-796, 842-843, 860-861, 1493-1494, 1949-1950 and 1967-1968. Notice that two of these tetrads followed the significant events. Only one (1967-1968) served as a partial precursor of the event. And notice that there was no significant event in Jewish history that was related to the first four tetrads that fell on Jewish feast days. So, what about it? Is the tetrad of 2014-2015 the herald of some major event that will impact Israel in particular? It could well be. The Bible makes it clear that God speaks through signs of nature, including signs in the heavens. The very first chapter of the Bible affirms this fact: "Then God said, 'Let there be lights in the expanse of the heavens to separate the day from the night, and let them be for signs and for seasons and for days and years...'" (Genesis 1:14). As for blood moons, the Bible refers to them several times. Some of the references only imply a blood moon when they speak of the moon being "darkened" (Isaiah 13:10, Joel 2:10, Joel 3:15, and Matthew 24:29). 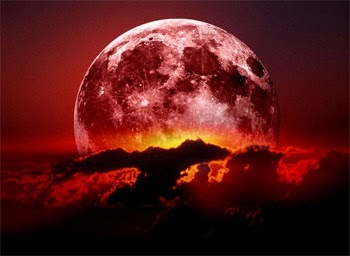 Others specifically mention a moon "turned to blood" (Joel 2:31 and Revelation 6:12). But the one thing all these verses have in common is that all of them refer to the Second Coming of the Messiah, and since that cannot occur in 2015, the tetrad of 2014-2015 — if it has any prophetic significance — cannot be a sign that the Messiah is going to return to earth at that time. It must have some other biblical significance, if any at all — as John Hagee argues in his excellent book. I think we should be very cautious about emphasizing signs like the Jewish feast tetrads. Such "signs" usually end up as prophetic embarrassments. Consider the mania that occurred in 1982 over the "Jupiter Effect." This line up of the planets was supposed to cause giant earthquakes and tsunamis. The year came and passed with no such significant events. Since that time, we have had to deal with similar manias concerning the Hale-Bop Comet in 1997, the Y2K computer "crisis" of 2000, and the Mayan Calendar in 2012. We should focus instead on the precise end time prophecies of the Bible that have been precisely fulfilled in our day and time — clearly indicating that we are living in the season of the Lord's return. One other thing — the signs in the heavens mentioned in the Bible that will accompany the Lord's return may not be natural astronomical occurrences at all. Instead, they may prove to be supernatural in nature, provided by God to herald His Son's return. That's what I believe happened at the First Coming of the Messiah. I don't believe the "star" that guided the Wise Men to Bethlehem was, in fact, a star. The actual word translated star in the Greek text of Matthew 2:2, (aster) can mean "radiance." I believe this guiding radiance was the Shekinah Glory of God. How else could it have guided them and then stood still over Bethlehem? (Matthew 2:9). BOOM!!! Dr. Reagan hits it out of the park. Time will reveal all. Maranatha!! Always level headed and conservative. Makes me trust you even more. Well put Dr Reagan. But firstly is there any Scriptural basis for calling a lunar eclipse a "blood moon"? Unless that can be established, it seems to be all hype and sensationalism.